CryoEco has gathered in Kangerlussuaq, Greenland, and successfully invaded Camp Doom, previously set up by University of Bristol researchers and located near Leverett Glacier and its large outlet river. 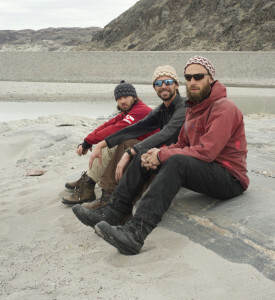 We will work together to monitor the river, which is draining a large catchment of the ice sheet, to identify subglacial outburst events during which large amounts of subglacial sediment are flushed from beneath the ice, and to collect samples of this sediment for geochemical and microbiological analysis. This will hopefully allow us to quantify microbe-mediated organic carbon transformation processes in the subglacial ecosystem beneath the SW portion of the Greenland ice sheet. Marek, Tyler, and Jakub on the way to Camp Doom, wearing the classic viper hats.